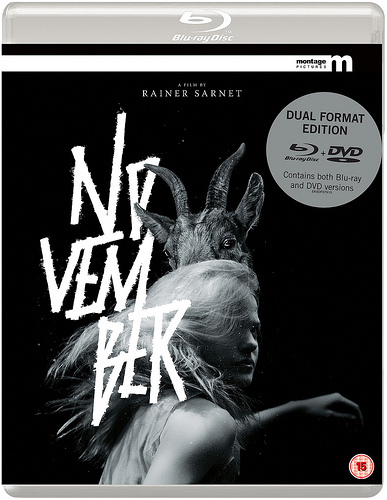 One of the most inventive, magical, and also exceedingly funny films of recent international cinema, November evokes influences as varied as Guy Maddin and The Brothers Grimm, Bela Tarr and Jan vankmajer, while also remaining wholly and deliriously original. It’s unlike anything else you’ve ever seen and that’s even if you’ve seen a bunch of black-and-white Estonian fairy tale films. Young Lina and Hans are preparing to marry in their village in the woods, when Hans becomes entranced by the arrival of a visiting baroness. Love spells are conjured so that each receives their intended mate, but there are more sinister things afoot. Death can visit in the form of a farm animal…but it’s fine because one can hide by wearing trousers on the head. And, besides, the dead can come back to the village and chat anyway…although when the devil arrives, don’t try to cheat him. And then there are the “kratts” supernatural servants made from discarded bones, tree branches, and trash…just make sure to give them work to do, or else. Director Rainer Sarnet‘s unique, hypnotic, and whimsical film has been a smash at film festivals, and once you fall under its spell, you’ll see why. A contemporary film already destined for multiple viewings and passionate cults, November will be haunting your dreams and tickling your funny bone for years to come.